If you use Cassandra you will find some interesting insights in this Planet Cassandra case study by Sematext client Recruiting.com. Hitendra Pratap Singh, a Cassandra Software Engineer, talks about why they decided to deploy Cassandra, other NoSQL solutions they looked at, advice for new Cassandra users, and more. “We started using SPM Performance Monitoring and Reporting from Sematext for Apache Solr and were impressed with the amount of real-time stats we could analyze using SPM. We expected the same amount of details for Cassandra as well and decided to go with SPM. Some of the benefits we’ve seen from SPM include the alert notification system, graphical interface [i.e. easy to analyze], detailed stats related to JVM, and creation of our own custom metrics. On the “Overview” screen found below, you can check out some Cassandra metrics, as well as various OS metrics. Specific Cassandra metrics can be drilled down by clicking on one of the tabs along the left side; these metrics include: Compactions, Bloom Filter (space used, false positives ratio), Write Requests (rate, count, latency), Pending Read Operations (read requests, read repair tasks, compactions), and more. You can read the full version of “Recruiting.com Powers Real-Time High Throughput Application with Apache Cassandra” at Planet Cassandra. And if you’d like to monitor Cassandra yourself (or any number of applications like Hadoop, HBase, Spark, Kafka, Elasticsearch, Solr, etc. ), check out a Free 30-day trial by registering here. There’s no commitment and no credit card required. 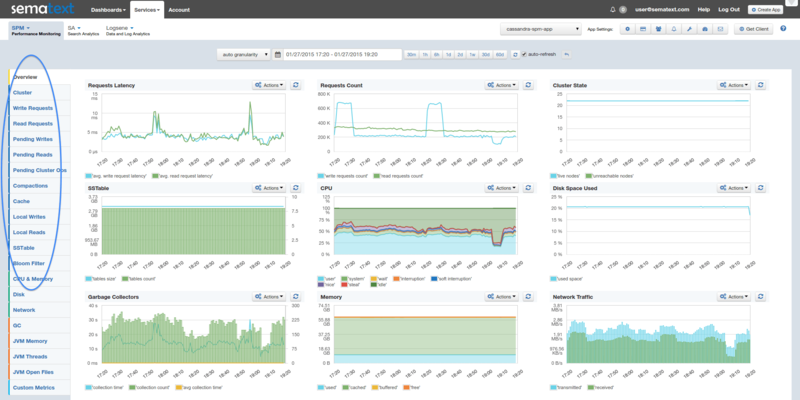 You can also see our Cassandra monitoring blog post for more details and screenshots.